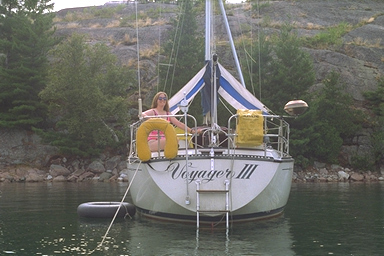 Voyager III is a 1985 Model 9.2A from S-2 Yachts of Holland, Michigan. Her original owner named her Family Circus and sailed her from Toledo Beach Marina on Lake Erie. As somtimes happens, he couldn't put much time in with her, and in early 1987 she was sold to the American Youth Hostels (AYH) Michigan Chapter. The AYH christened her Voyager III , a sentimental and favorite name since they had already campaigned two boats in that series. With AYH, Voyager III immediately became the favorite boat of the Voyager program. She began spending ten weeks each summer in the North Channel, and many days and evenings in the spring and fall sailing on Lake St. Clair. The AYH Sail Program eventually separated from the National AYH organization, and reorganized as The American Sailing Institute (ASI). Voyager III 's new owners, ASI, continued the cruising tradition with their Level 4 sailing program. Voyager III and her sister Serenity provide great sailing opportunities for members of ASI. Copyright © 1995, 1996, 1997 by James W. Hebert. All rights reserved.